The new GeoSwath Compact Survey Vessel (CSV) was shown for the first time at Ocean Business in Southampton, U.K. in early April. The first-ever KONGSBERG developed survey vessel integrates all the equipment needed to survey shallow coastal and inland waterways quickly. It is based on a powerful and maneuverable two-person catamaran equipped with the latest GeoSwath 4 shallow water multibeam system. The GeoSwath CSV features a 30 HP outboard motor and is road transportable on the supplied lightweight trailer, which enables launch and recovery from even the remotest of locations. 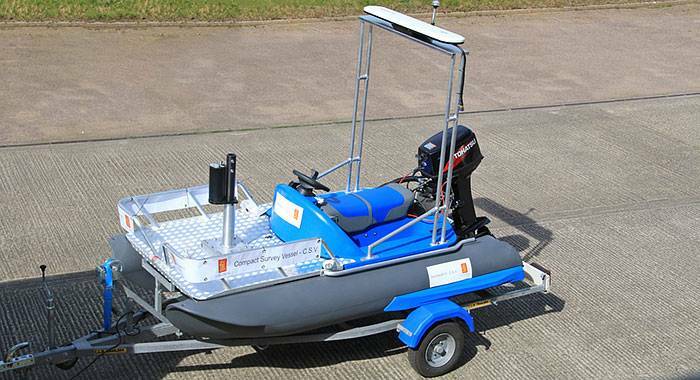 With a draft of only 0.35 metres and a dry weight of just 120kg the vessel can operate in extreme environments and utilising the full GeoSwath 4R system, it can map bathymetry and geo referenced side scan in minutes. The craft is light enough to be launched by one person, and all instrument controls, communication systems and survey operating tools are ergonomically designed so that everything can be accessed from the helmsman's position. The GeoSwath multibeam system is mounted on a retractable pole with pre-installed motion sensor, GPS heading & position system and sound velocity sensor. The operator uses a console mounted ruggedised laptop to plan and control the survey. The vessel is even equipped with a VHF radio and is coastguard approved for use at sea with an International Marine Certificate. By design, the GeoSwath CSV is effective in a wide range of shallow survey applications. Its shallow draft, high top speed and manoeuvrability combined with the stability of a catamaran hull make it ideal for use in both marine surveys and on canals, river and lakes. The ability to steer tight survey grids and quickly get from launch site to survey location and back makes it a fast and accurate addition to the surveyor's portfolio. "KONGSBERG is famous for providing the most extensive technology portfolio for the professional survey market, but this is the first time we have offered a complete survey vessel to our customers," said Bill Hone, Sales Manager Underwater Mapping systems, Kongsberg Maritime. "The concept is simple; we have integrated our leading survey technology with a solid, high quality vessel, resulting in a turnkey solution from a single supplier."